I guess i`m simply a homeboy at heart.I`ve spent every xmas at home since I was born …I love it. Xmas day with the family and then my best meal of the year at Mum n dads on Boxing day , cold Turkey , chips , eggs , chutneys and half a dozen slices of bread….WOW. This year I threw caution to the wind and I decided to do something a little different than the norm , I jetted off to Asia wth a couple of friends to celebrate the festive season in a whole new way. 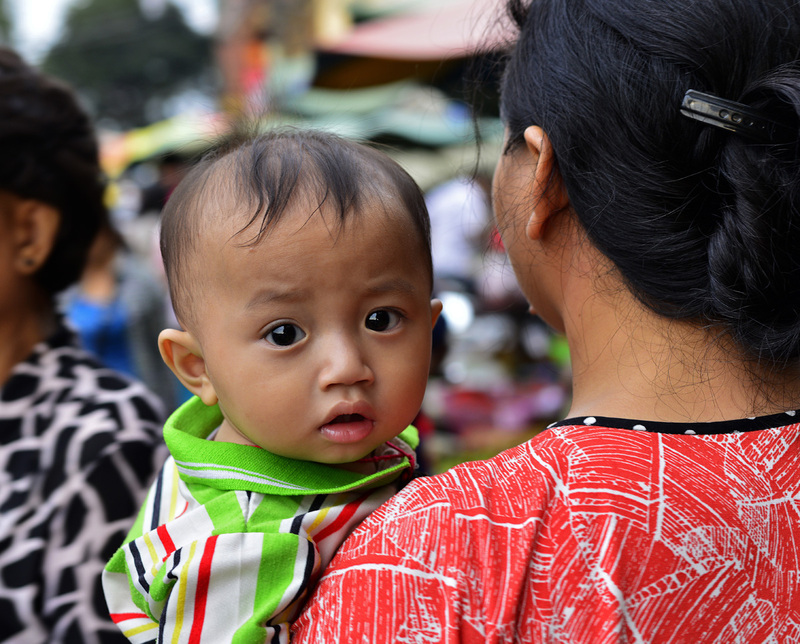 Xmas in Phnom Penh , Cambodia followed by New year on a Thai beach and a couple of stop overs in my favourite city , Bangkok. 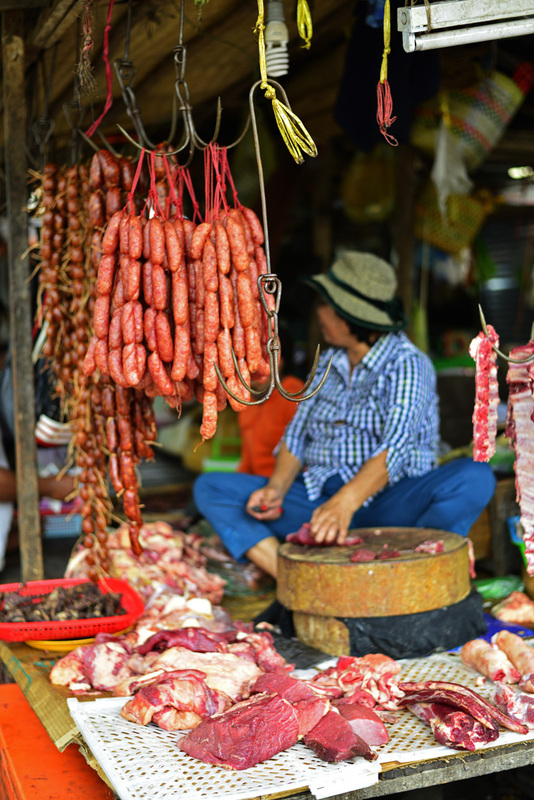 As always, most of the time I would spend eating street food and slurping down ice cold San Miguel in the bar , scoffing cakes and exploring the markets and as usual I would be armed with my trusty little camera to capture the moment…and so on we go to Cambodia. 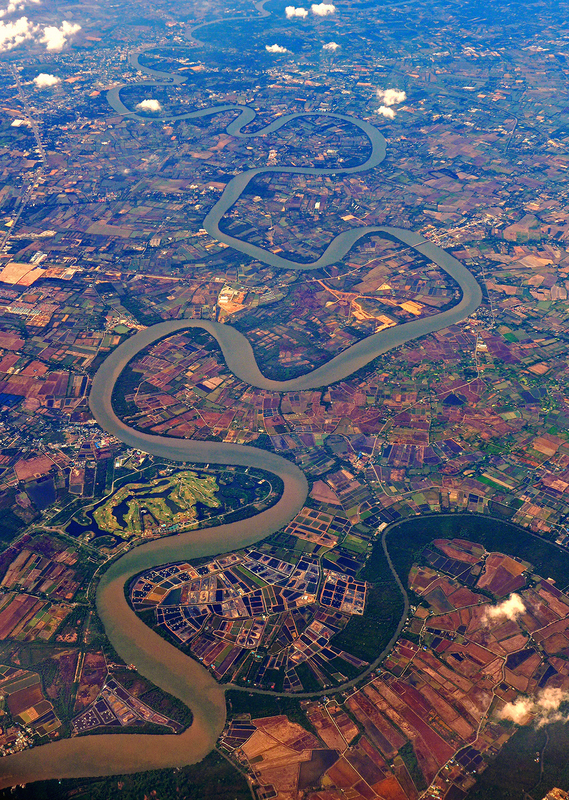 Leaving Bangkok city on Xmas eve en route to Phnom Penh and over the Bang Pakong River. 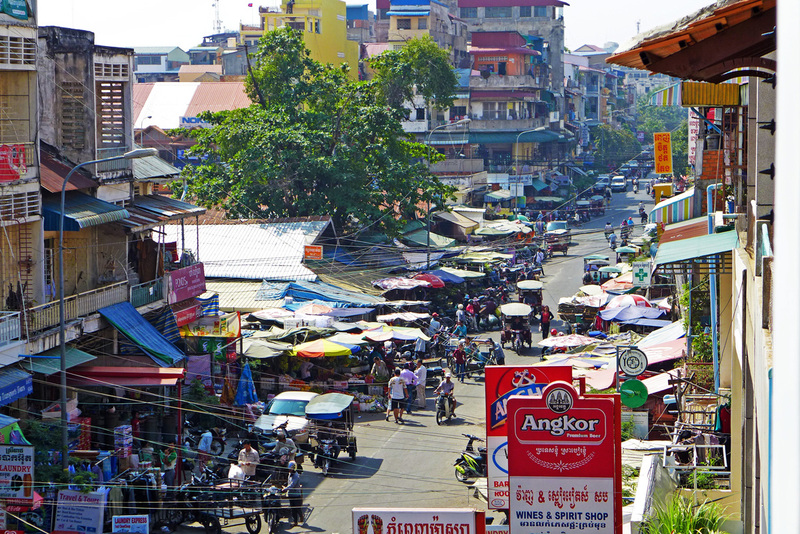 So this is where my hotel was situated…forget the beach view , its more interesting looking off the balcony at this lot…Phnom penh market. 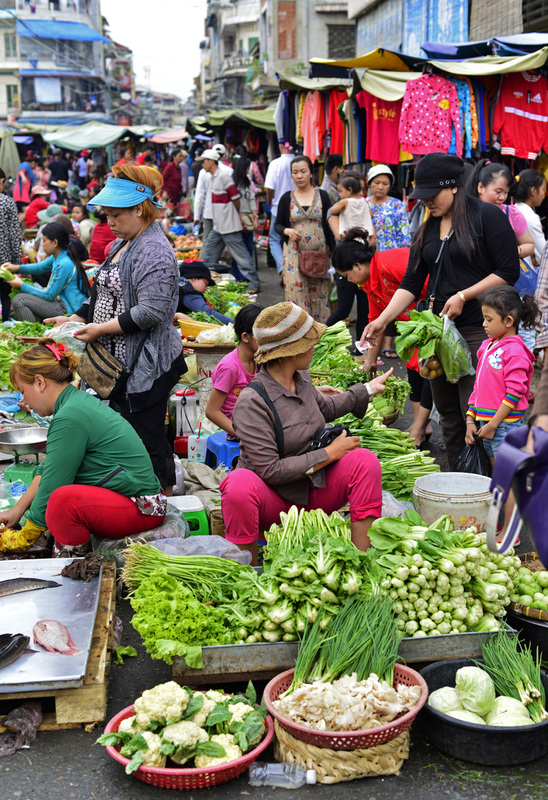 If only we had markets like this in the UK, so fresh and constantly being sprayed with water and passionately cared for to keep the produce in pristine condition. 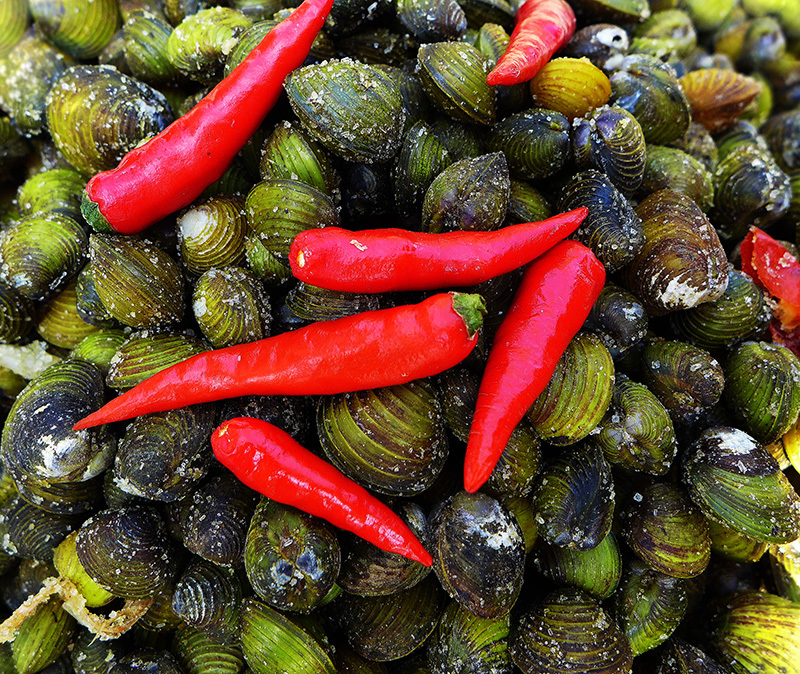 Tiny Clams raked out of the sea at low tide, cooked and served with a spiced salt. These are wheeled around the market in barrows and bagged up to order. 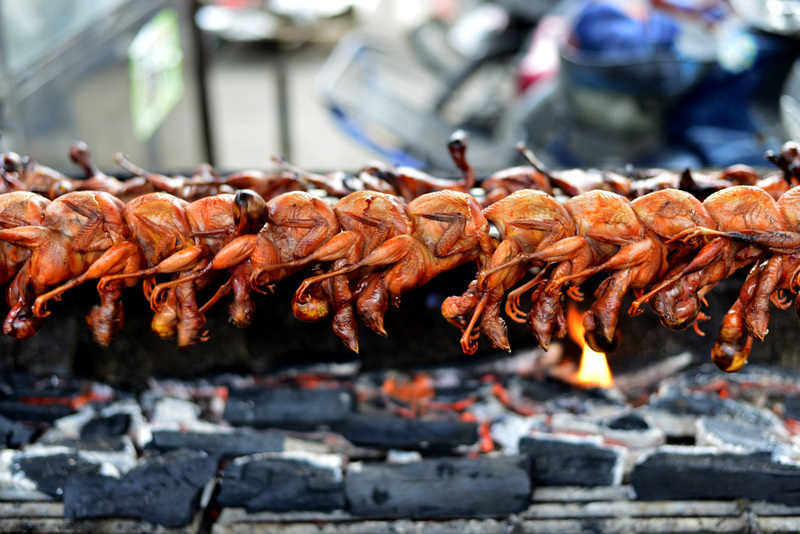 Not sure if the crazy dog was for sale…..but when in Cambodia , eat like the locals. 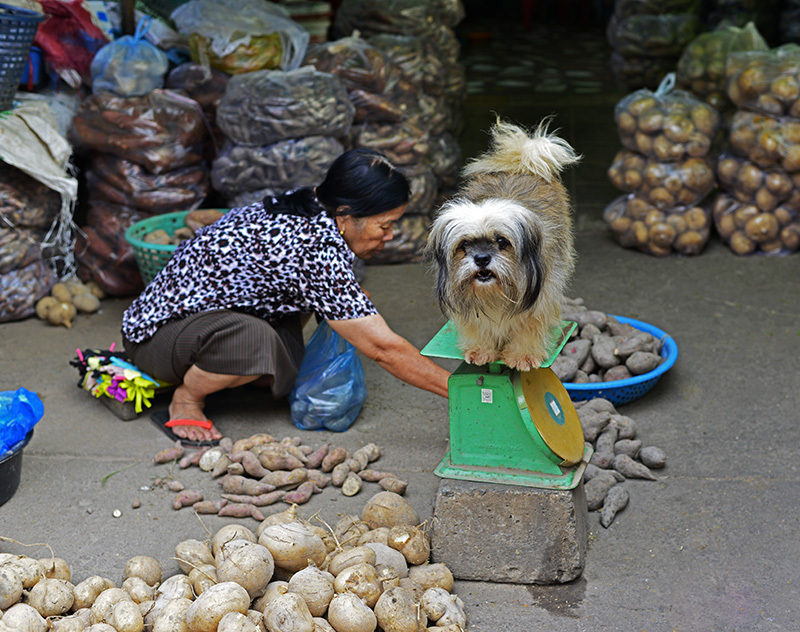 This lady sold various tubers and root vegetables. 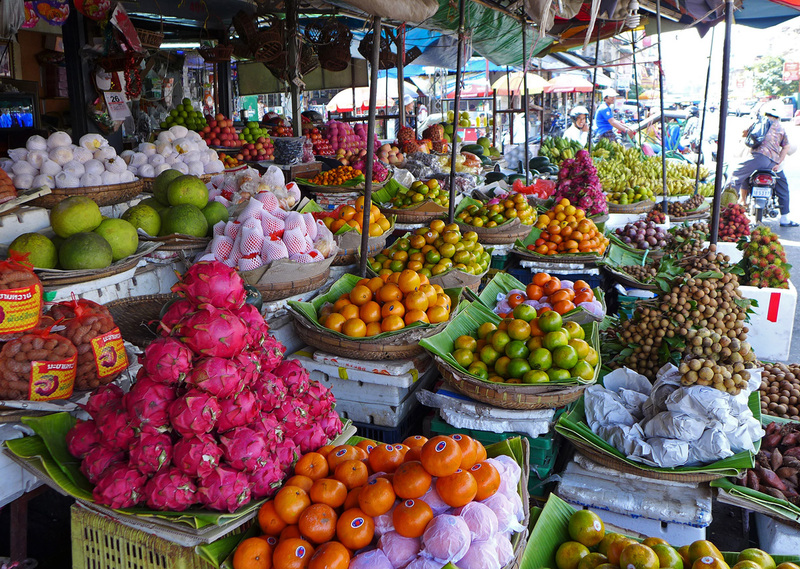 The colours of the market were truly amazing , a feast for the eyes. These Chillis were just a small selection of a variety of fresh and dried on sale. 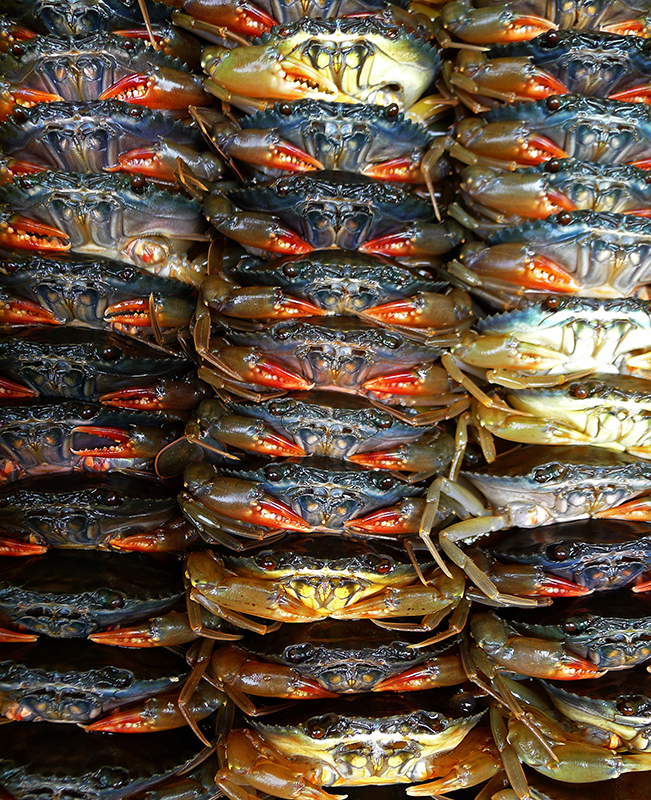 The Shellfish army lines up for attack…. try picking one of these for your pot , they`re ultra snappy and violent. I`m not entirely sure what these are but I loved the colours. 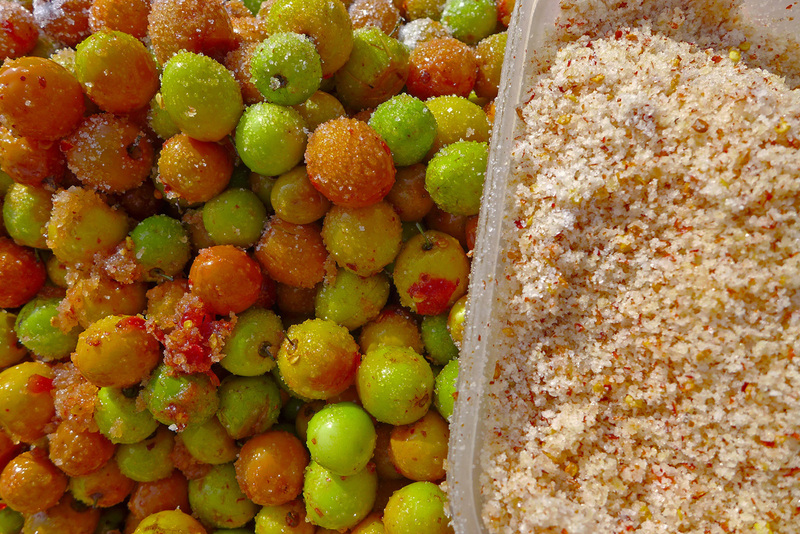 They`re a type of sour unripe fruit and they come with Chilli sugar…sweet , sour , spicy , bitter….Yes, you`re in Asia and its all a play on the senses of taste. 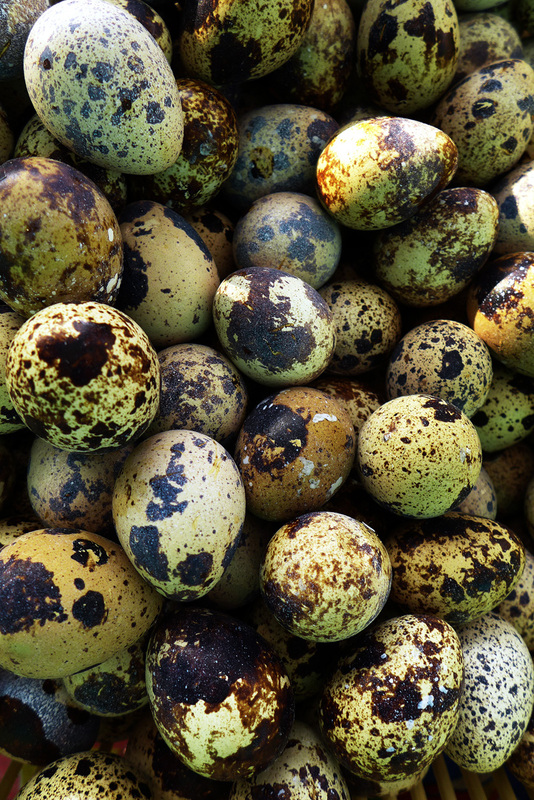 100 Year old Eggs…..Well they`re not really that old. 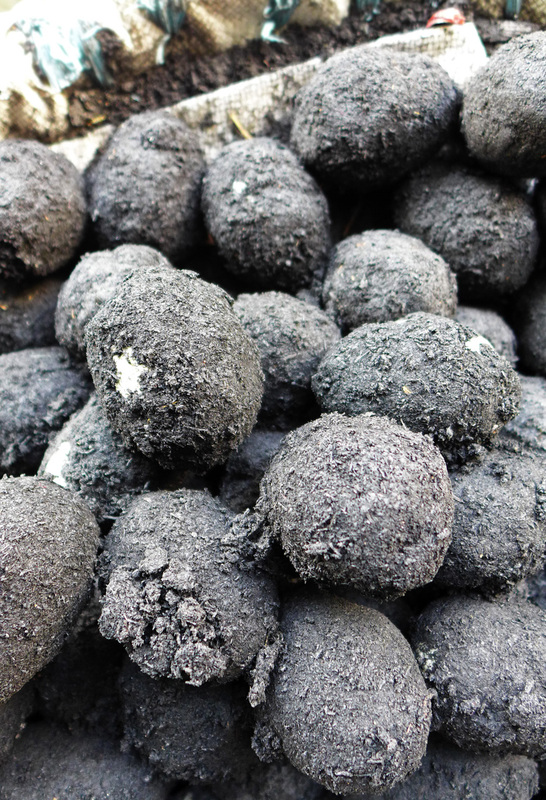 Basically hardboiled Eggs coated in a mixture of clay , Ash , Lime and salt. 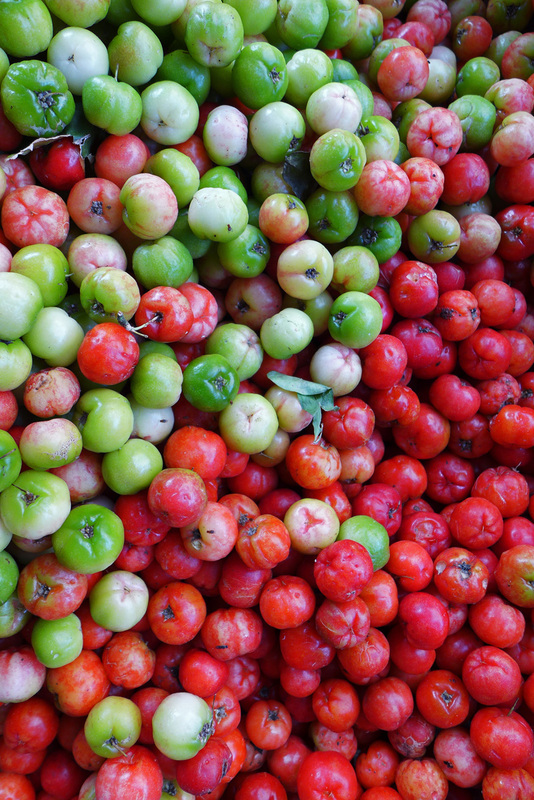 Now I don`t know what they taste like or how you eat them so maybe best just google that one. 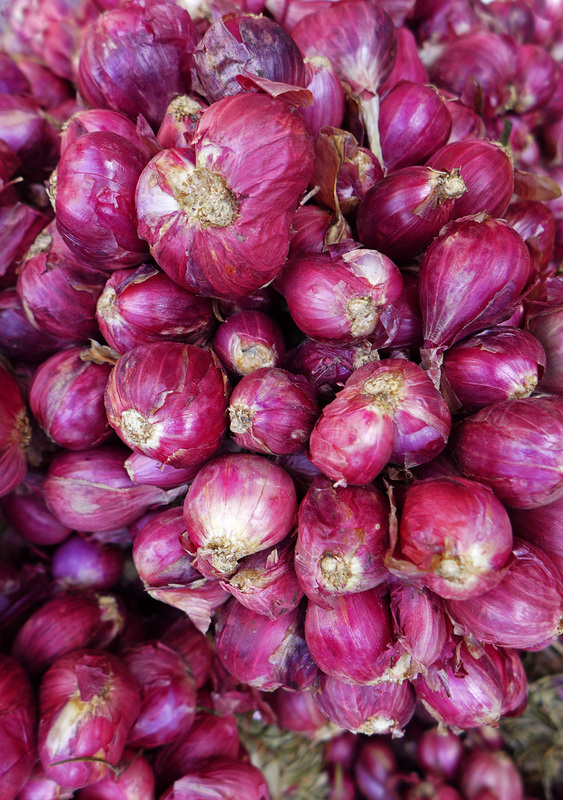 Asian Shallots , a basic in almost all recipes. 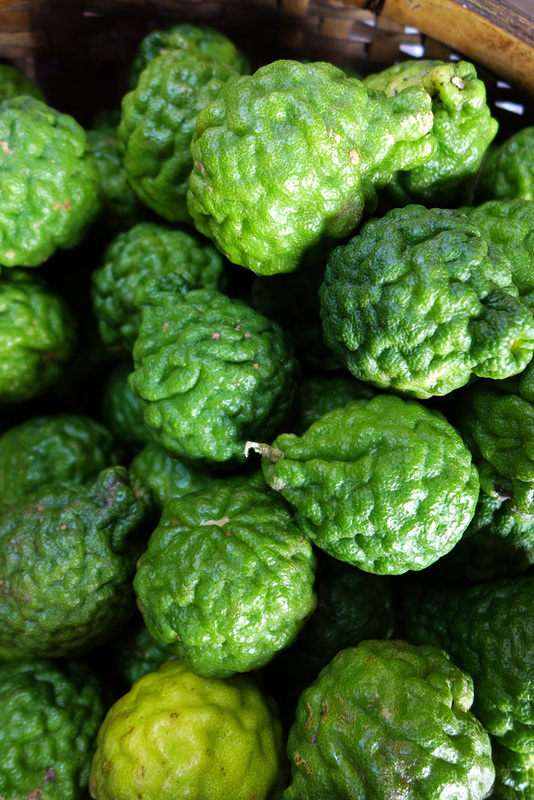 Makrut Limes , these are mainly used for the skin as they have very little juice inside. 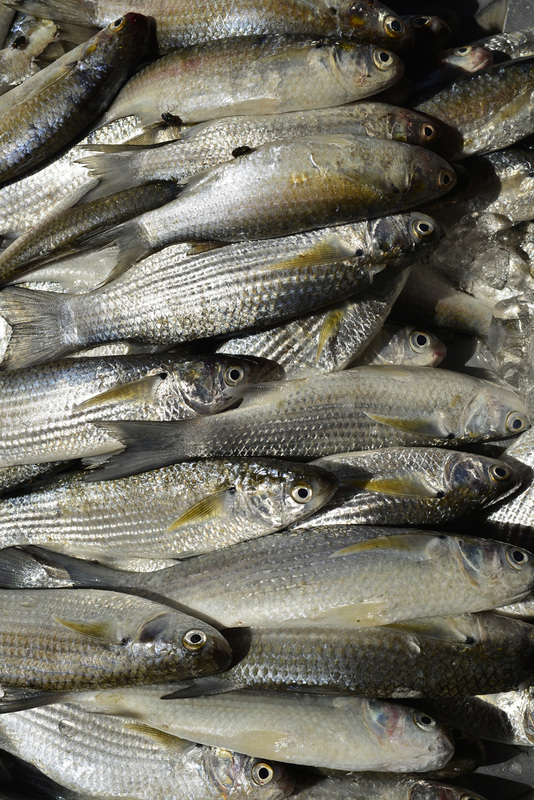 The skins are highly aromatic and used for cooking as well as skin products and essential oils. 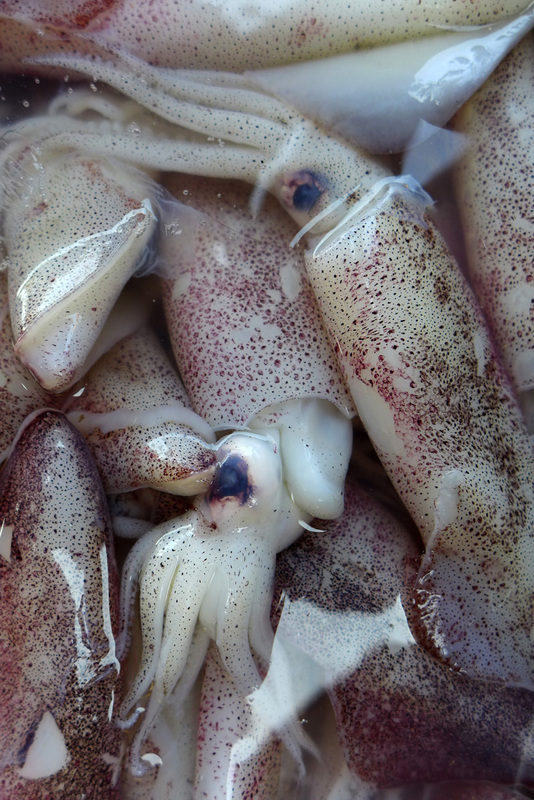 The Squid were still alive and were probably the previous nights catch. The weather was hot.. very hot but not humid. It was actually their Winter season. Now personally I wouldn’t buy my meat in such temperatures as my stomach isn`t lined with Asbestos. 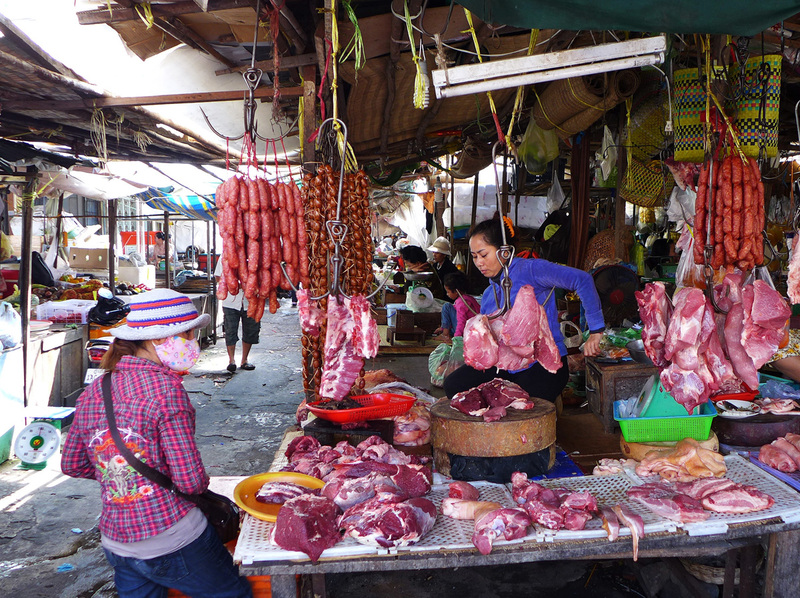 The locals however had only the one choice and so this is where they bought their meat from. Strangely enough there wasn`t a fly in sight. 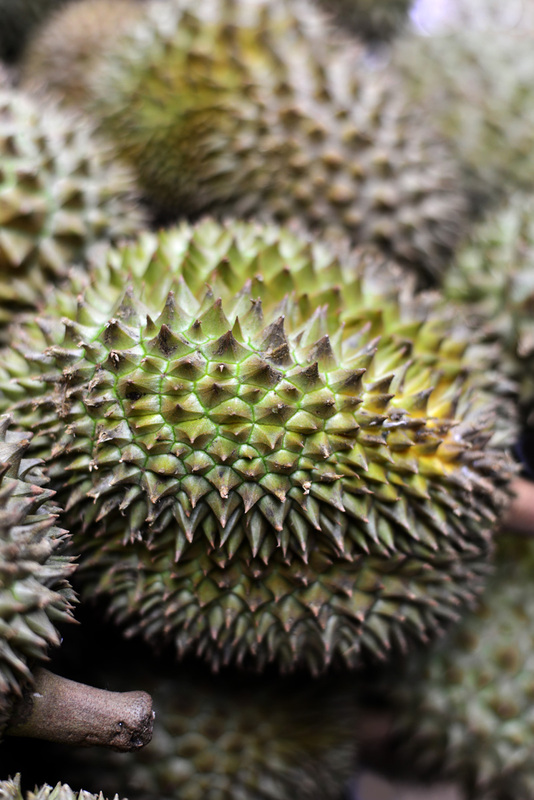 This strange fruit is one of the most popular and controversial fruits of Asia…The ” King of Fruits “…The Durian. 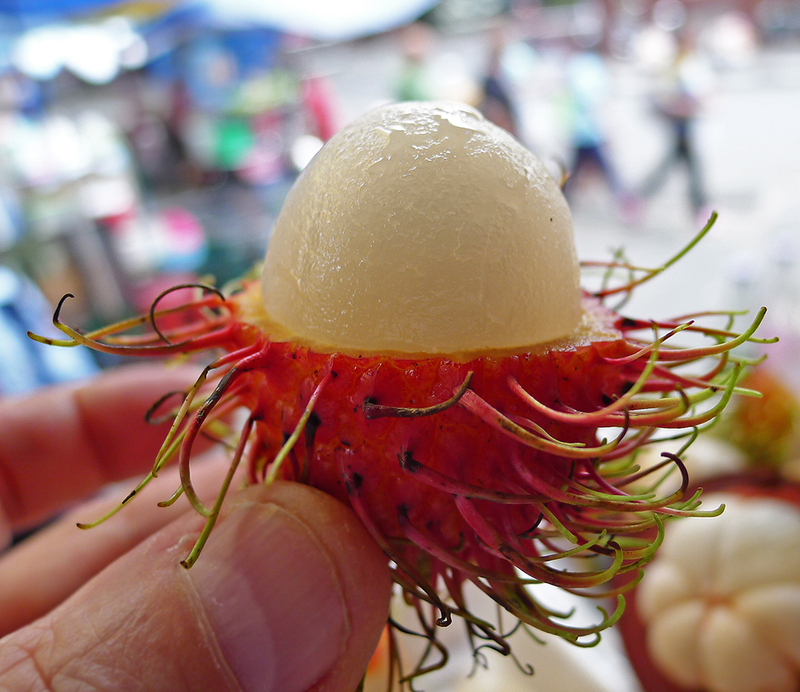 Inside the hard spiked outer layer lies delicate lobes of a very soft fruit…..which stinks like sweaty socks , Turpentine , Raw sewers and Rotten Onions. It`s actually banned in some hotels and public transport because of its foul smell. You can`t eat it with alcohol in your bloodstream as some say it can actually kill or cause severe burning and digestive disorders…hence why it has taken me six years to try it….and it`s bloody lovely. Fair enough it does absolutely stink but the creamy flesh actually tastes totally delicious , Almond flavoured creamy Custard is my closest description. Anyone travelling to Asia simply has to try this one out. 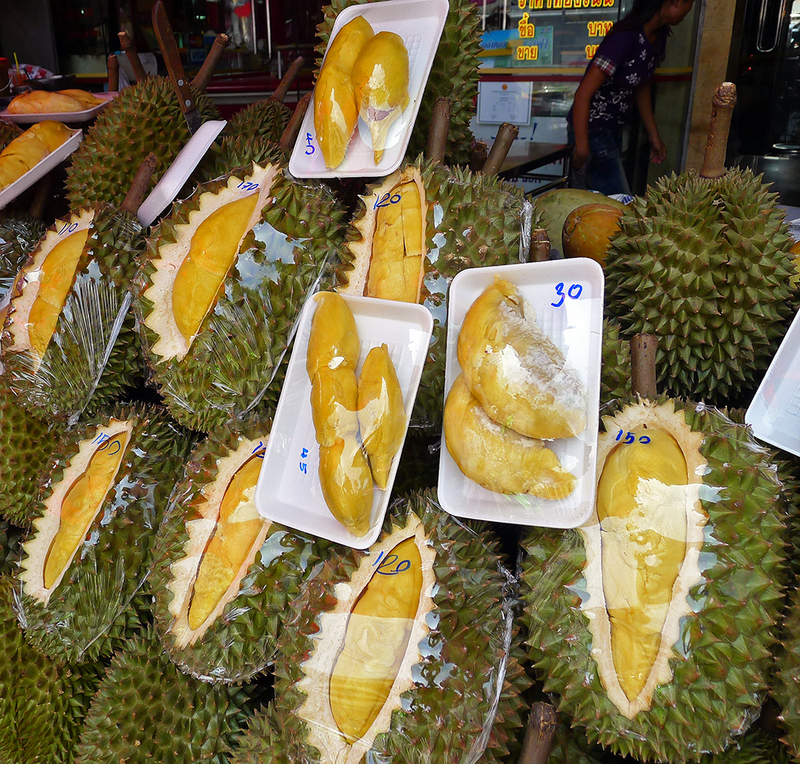 You can see from this photo how the Durian is displayed for sale. It`s split open to reveal the fresh flesh inside…and then plastic wrapped because of the smell.These ones here are so cheap , 80p for a sample and for a full fruit average price is £2 to £3. I wasn`t quite sure what these little birds were…probably small chickens. 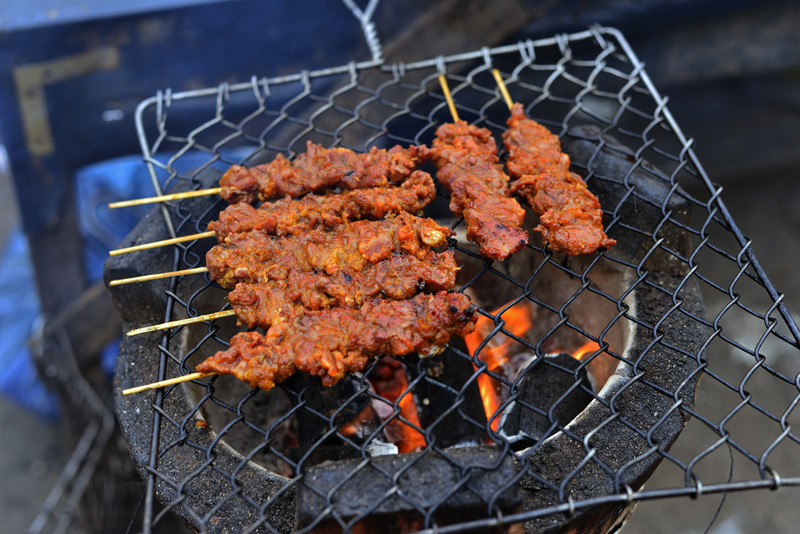 The smell was amazing as they cooked slowly over the hot charcoals. 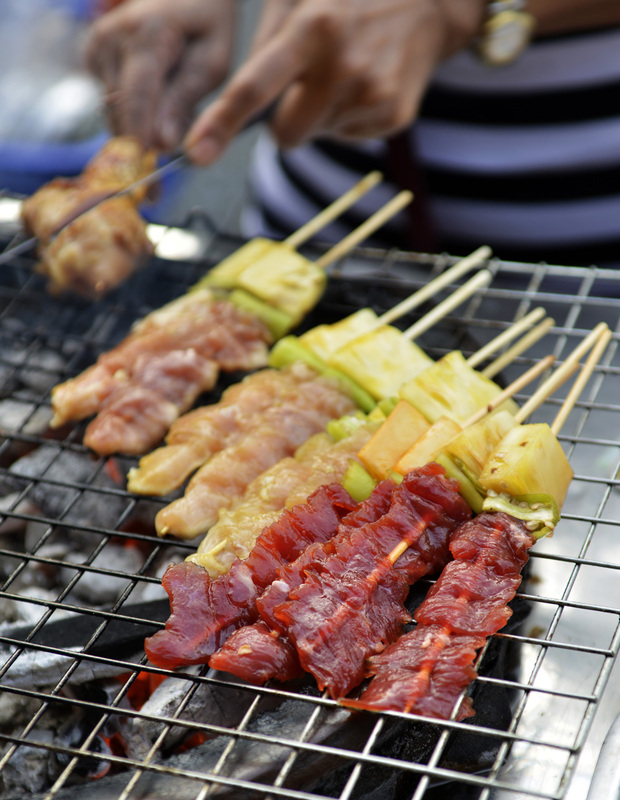 BBQ food is everywhere in Asia. This wasn`t for sale , it was the market traders lunch. 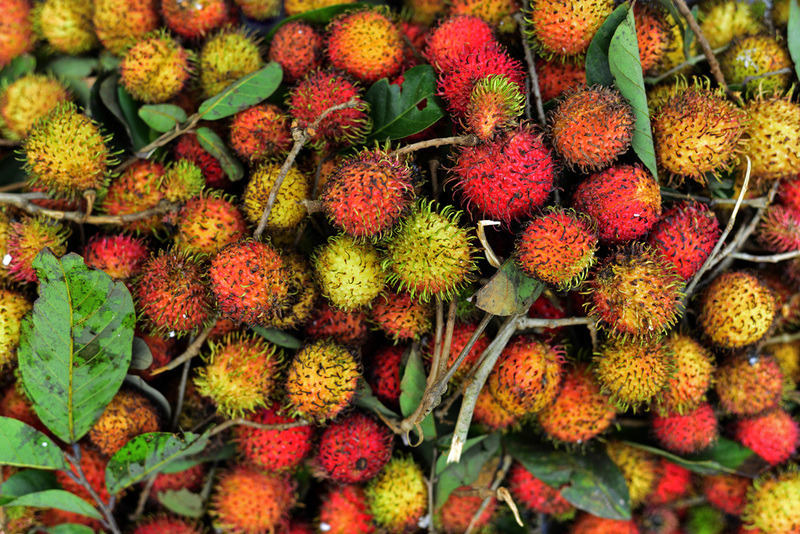 Rambutan fruit , Sweet , delicious and highly perfumed flesh inside. 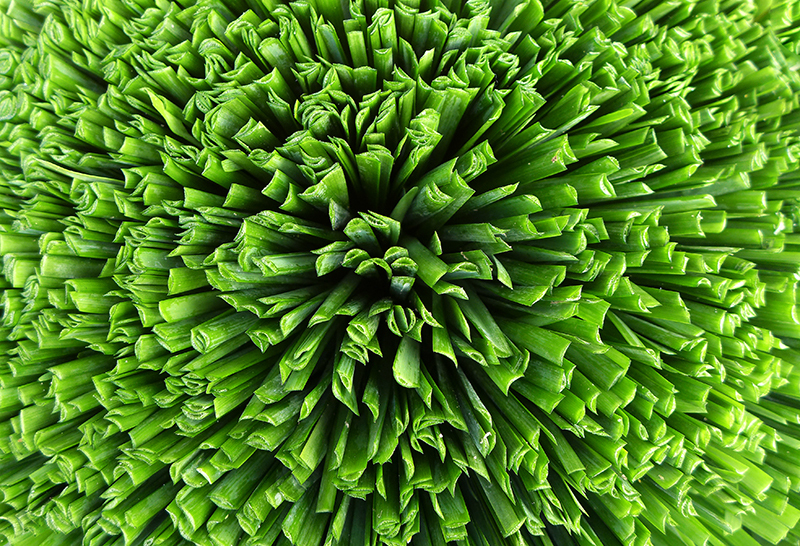 Garlic chives harvested on the verge of flowering. 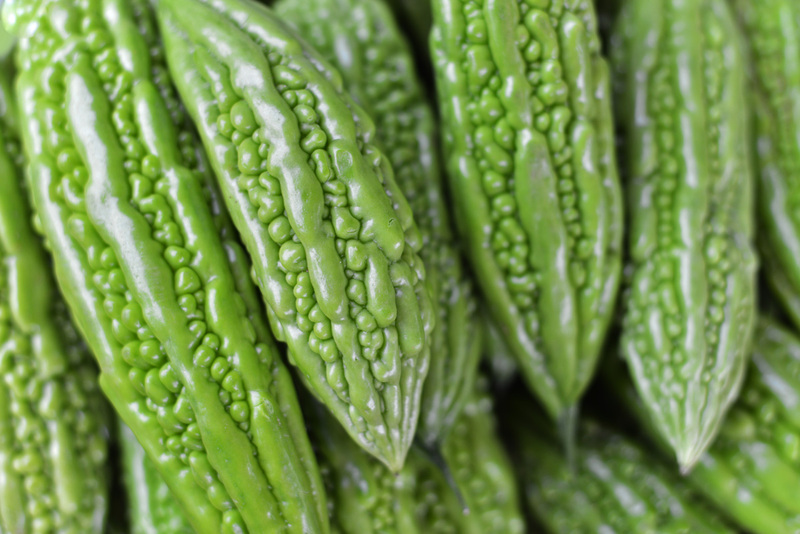 Bitter Melon – used throughout Asia as a vegetable , stuffed , fried , added to curries and stir fries or pounded and mixed with Yoghurt as a side dish. 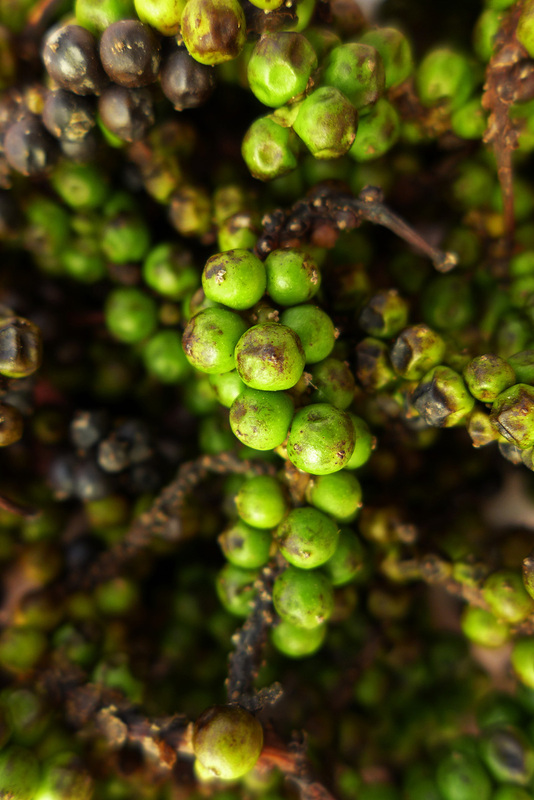 Kampot Peppercorns…The King of Pepper and adds a totally unique flavour to Cambodian seafood dishes. 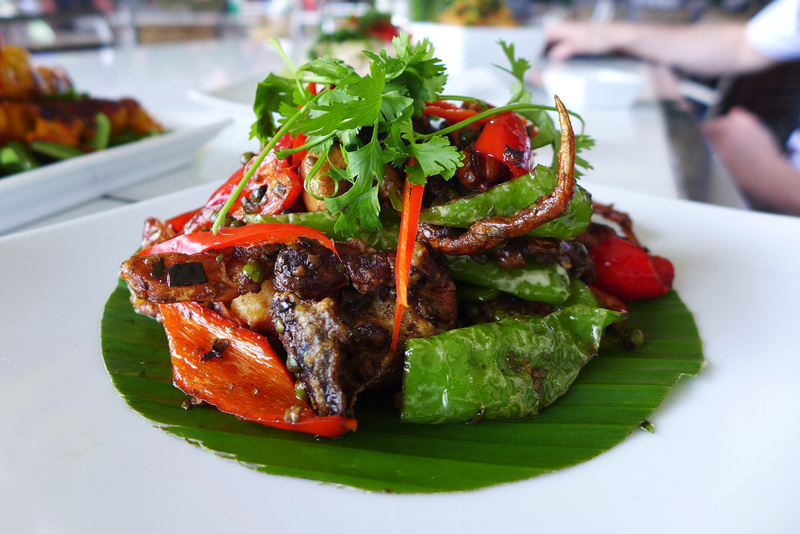 This is a stunning dish of fried soft shell Crabs with Kampot peppercorns in a local restaurant.Hot and spicy from the chilli and pepper , sweet sensation from the Crab and aromatic from the lime and coriander….awesome flavour combinations. Cha k`dor , a proper mouth burner – stir fried Chicken with Chilli , Coriander and Lemon grass.Very simple food but so full of flavour. Chicken with Garlic, Basil and Chilli. 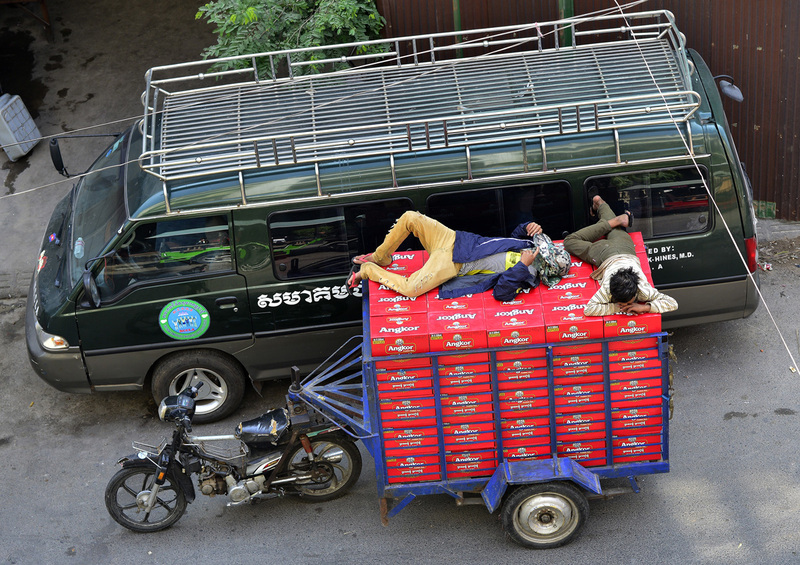 And at the end of a hard day the guys deliver the nightly round of Angkor beer…..and then end up crashing out on top of it. So on to Bangkok for a one night stop before heading south to Pattaya. 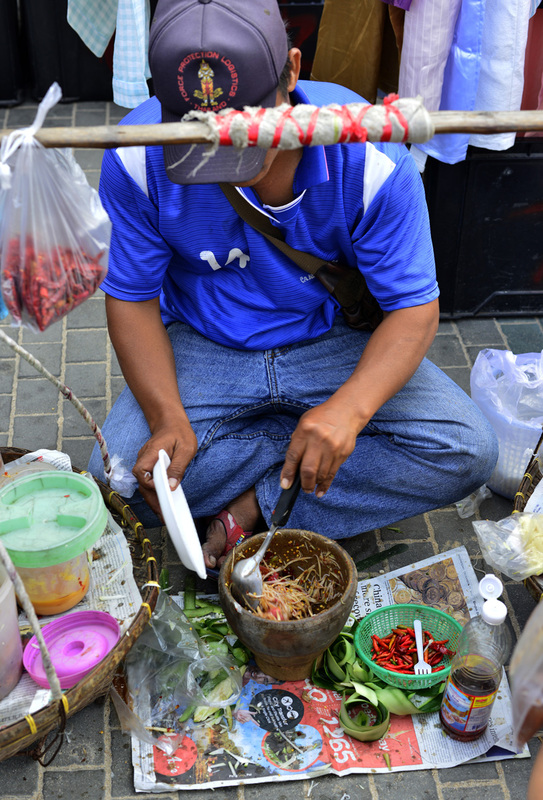 The city is well known for its street food and around every corner there`s a street vendor selling their unique delights. 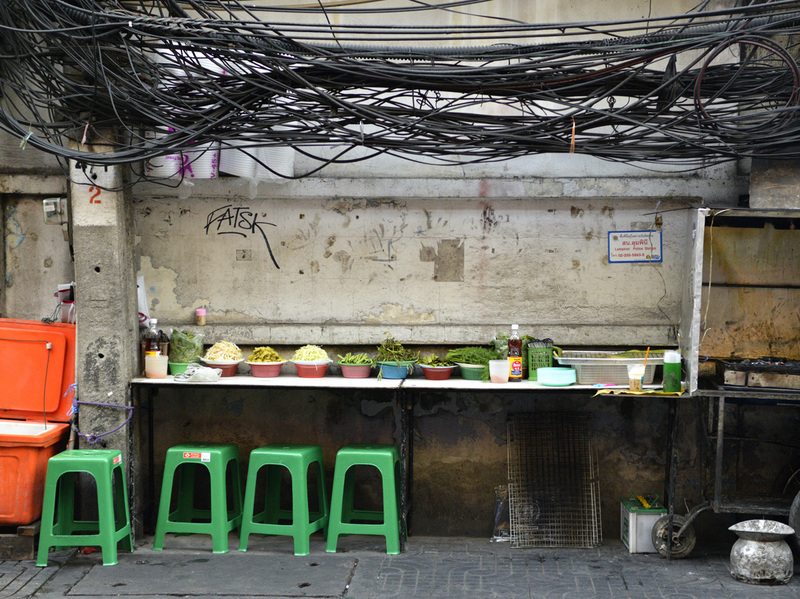 Some are pretty amazing…others downright horrific ( as you will soon see ) So here , tucked away on the side of the street is a typical street food stall. The ingredients are super fresh and the couple of dishes they specialise in are on the table within 2 to 3 minutes at the most. Plastic chairs , wooden benches and world class food. 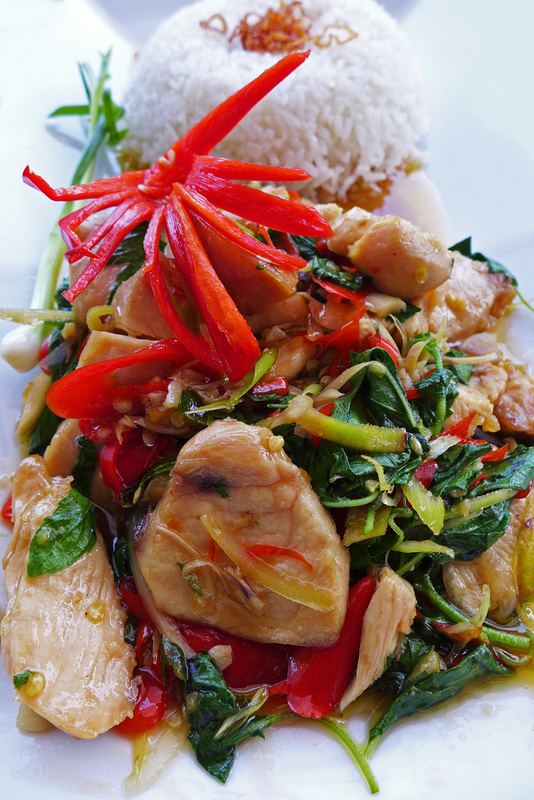 The 2 dishes below are big Thai favourites. Pad Thai Goong ( Noodles with beansprouts , tamarind and shrimp ) and a very healthy Chicken Noodle soup. 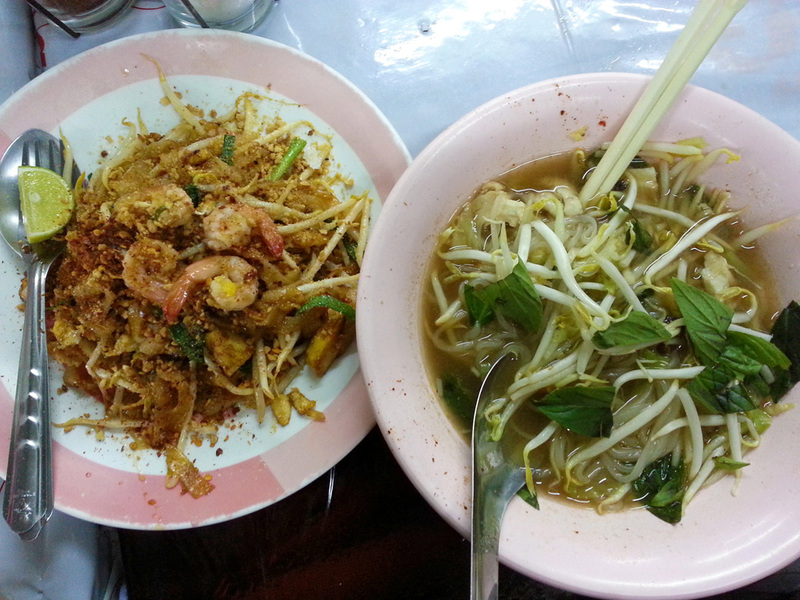 Both dishes cost 70 Baht which equates to £1.40 ($2). The Pad Thai arrives with the traditional Thai accompaniments which immediately take it to new heights and totally change the dish. 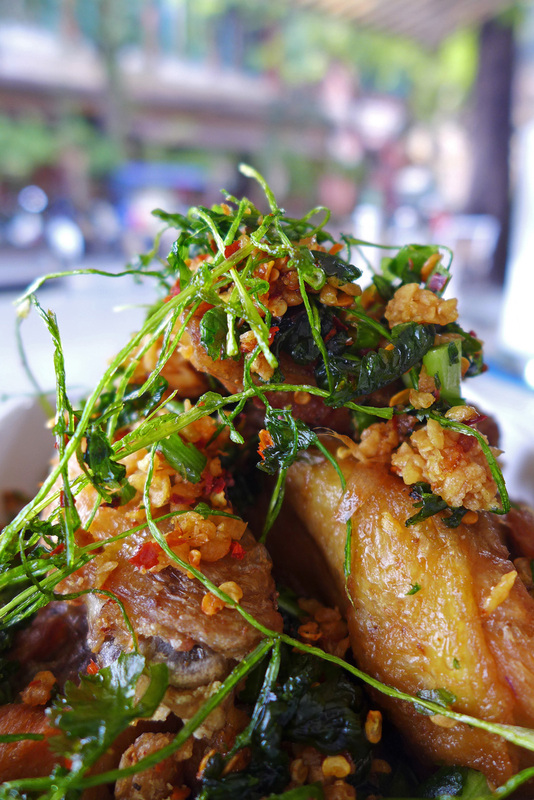 Sugar ,Fresh Lime ,Fish sauce , Chilli flakes and Ground Peanuts .These impart the magical tastes of Asia into the dish. Sweet , Sour , Salty , Spicy and Umami. 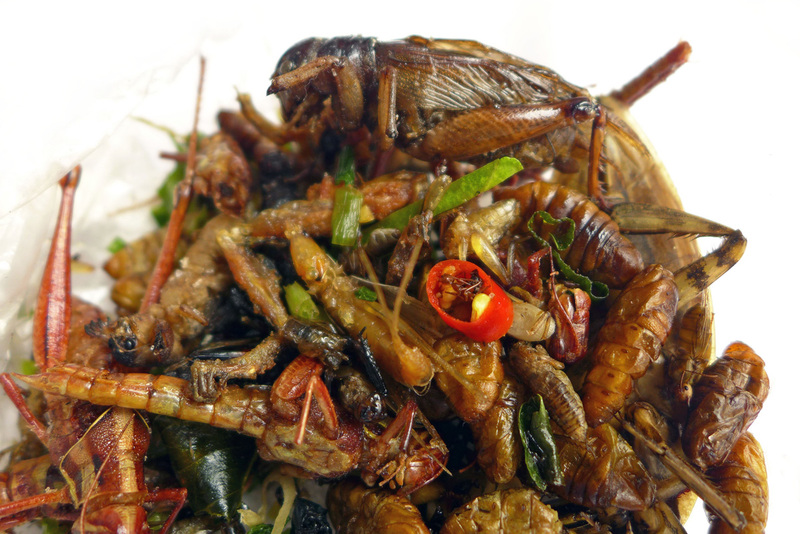 Now then….here`s a little look at some typical Thai bar snacks…. 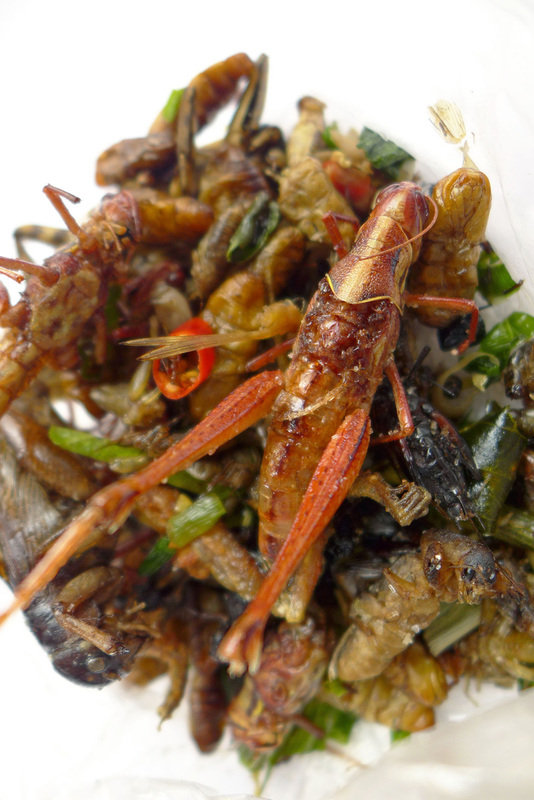 Deep fried Insects. The Thais love them , the westerners keep their distance from them.The odd brave Farang ( westerner ) will nibble at one to play the hero of the bar but it soon gets spat out once the flavours hit the tastebuds. 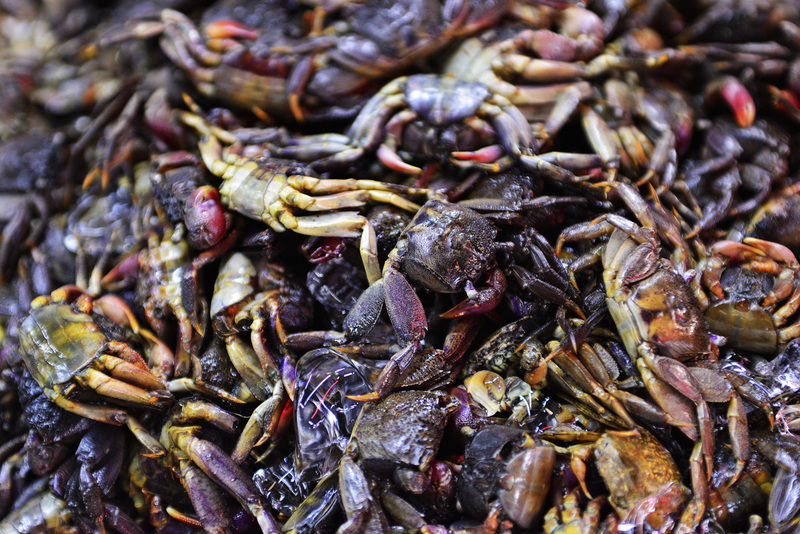 They all come separate for those that like a particular species but on the whole theyre mixed up in a bag , nice and hot and come with stir fried garlic , chilli and lemon grass. 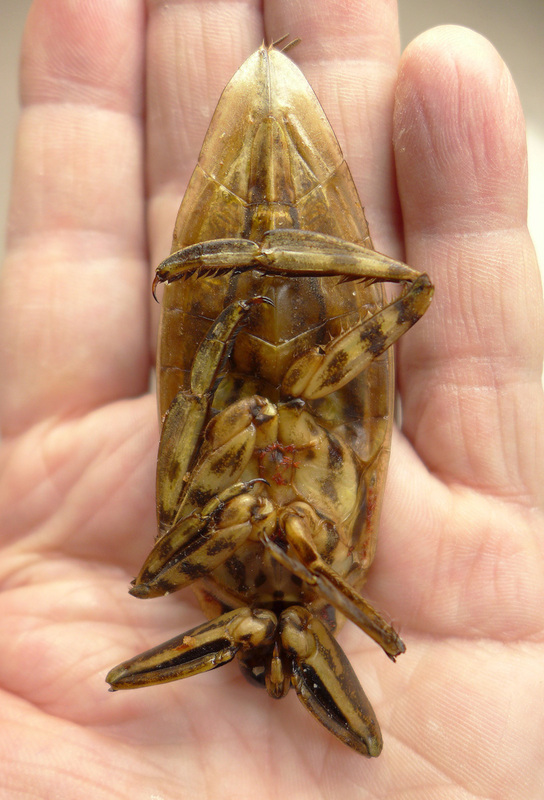 The ones below include Grasshoppers , Giant water bugs , Crickets , Locusts , Silk worm larvae , Mole crickets, Frogs and Scorpions. I`ve drunkenly nibbled in the past and I can only say they`re bloody awful. 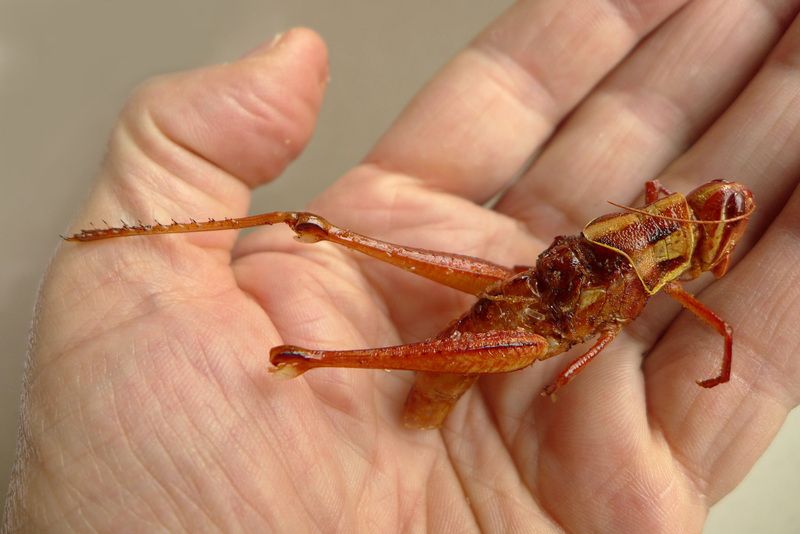 A deep fried Locust….This one wasn’t flying tonight. 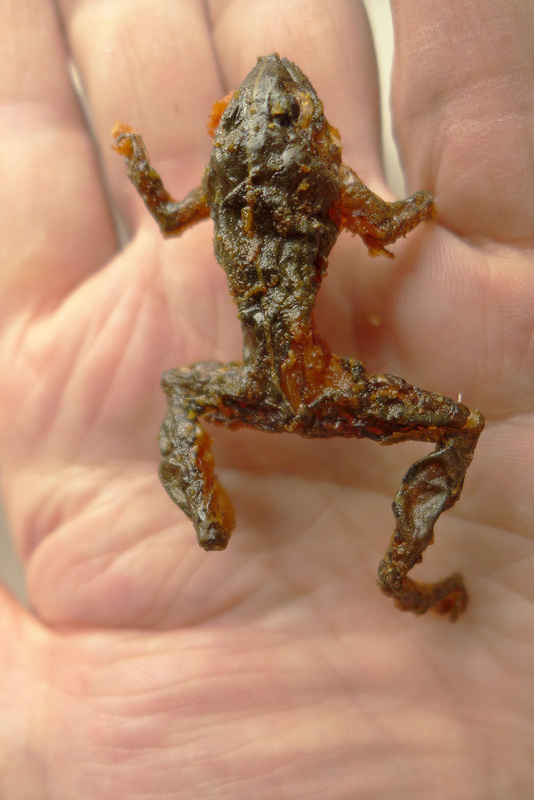 Crispy deep fried Frog….They`re actually not that bad….after 10 bottles of beer. 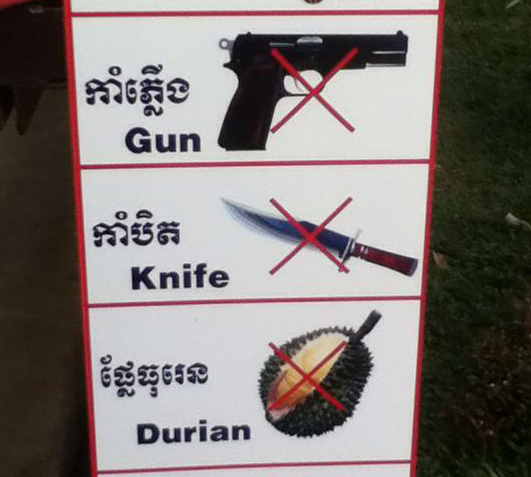 O…M…G… The Thais love them. 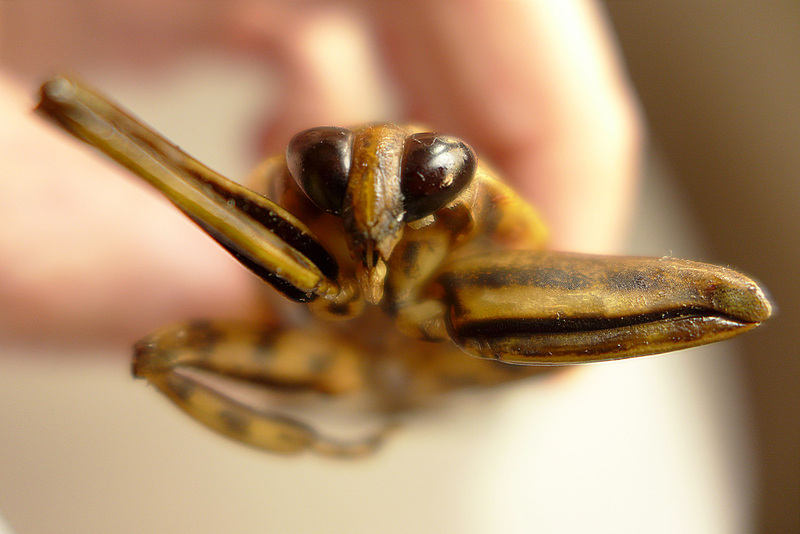 Giant water bugs….Not a chance. Could you honestly put that in your mouth ? It`s even got claws. Ok….enough`s enough….Lets go to Pattaya beach now for new year. 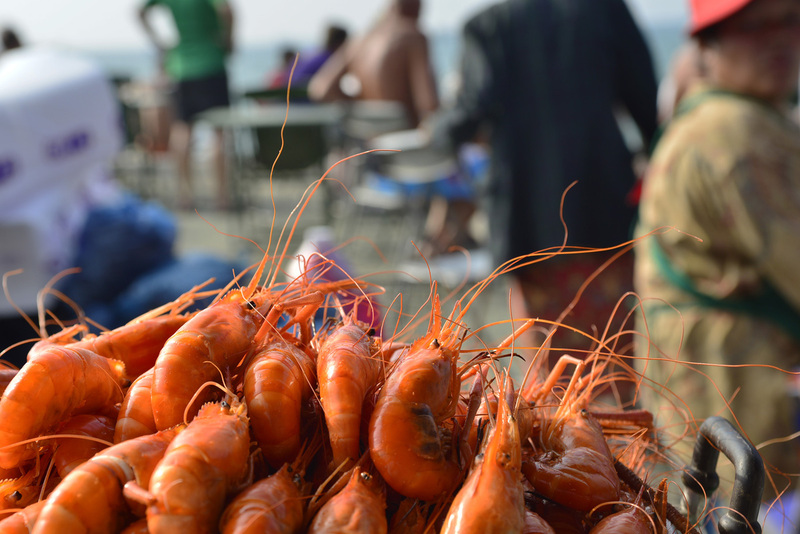 The market was in full swing when we arrived so it was straight out for a beach feast. 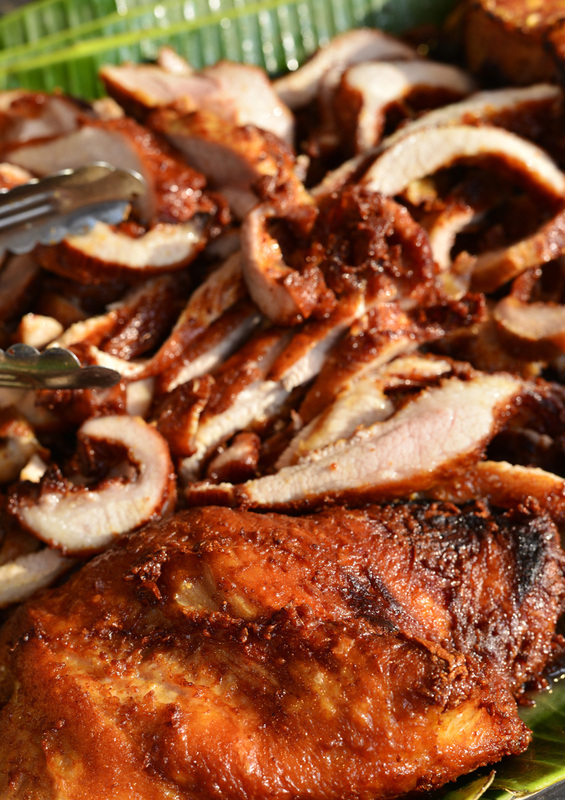 The smell was amazing , everything was being BBQ`d. 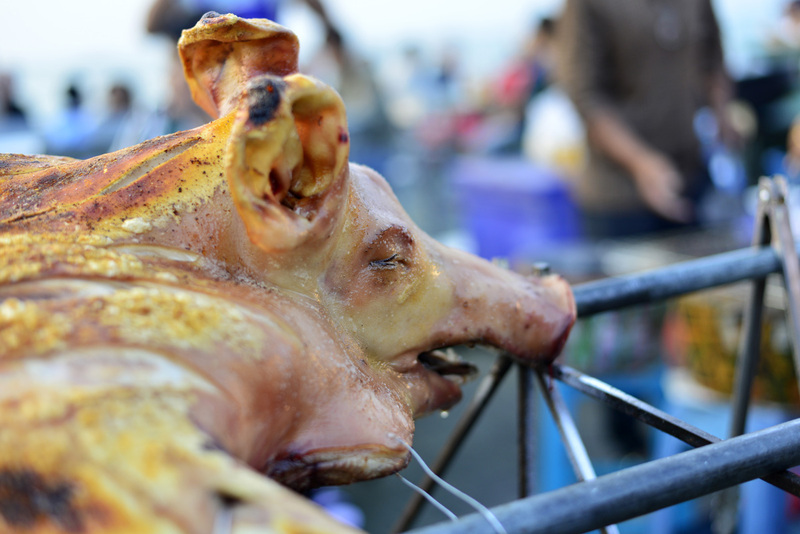 I decided celebrate my arrival for New year by having this Thai spit roasted Pig on the beach. 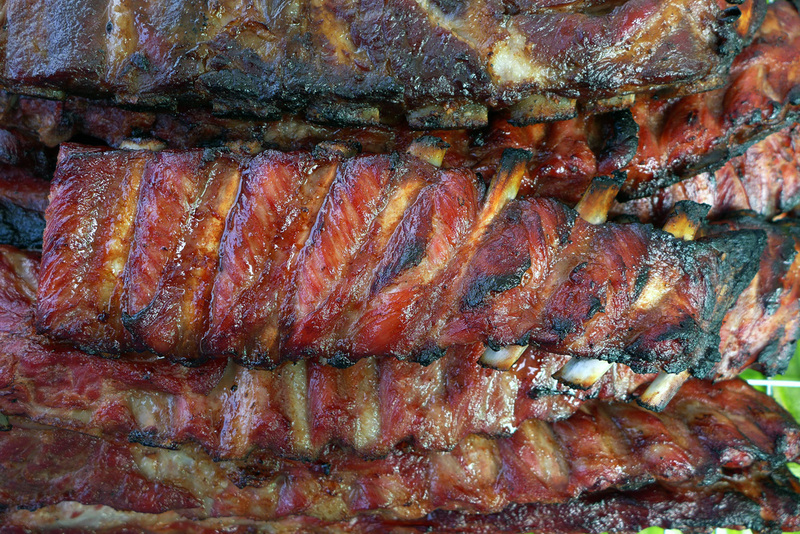 The Pork ribs are glazed and roasted In large earthenware pots over wood. As a result they taste exactly as you would expect….Amazing. 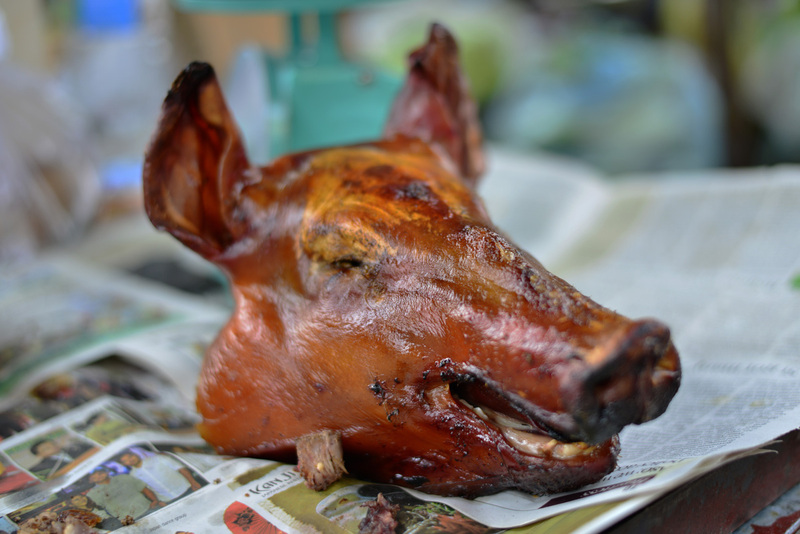 Poor little Piggy even gets his head sold off , crispy and every piece edible. 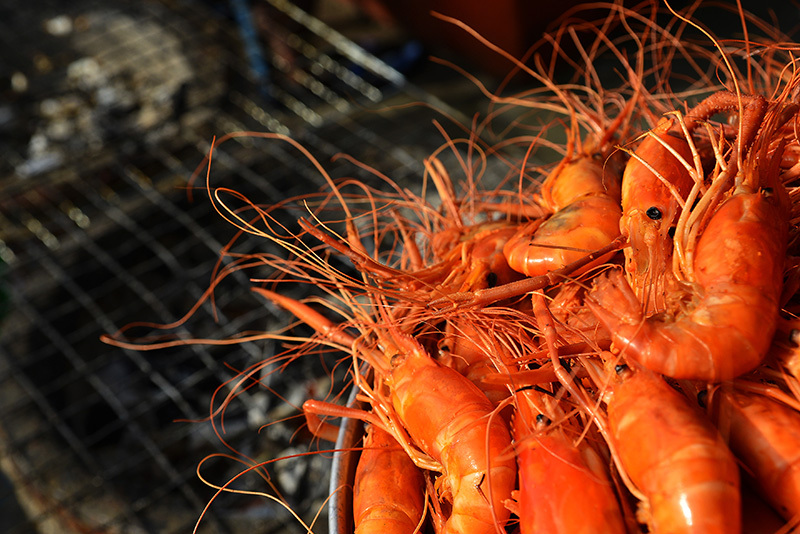 Bucketfuls of big Shrimp are boiled and then charred over hot coals , they`re then skewered or bagged up and sold to the sunbathers. 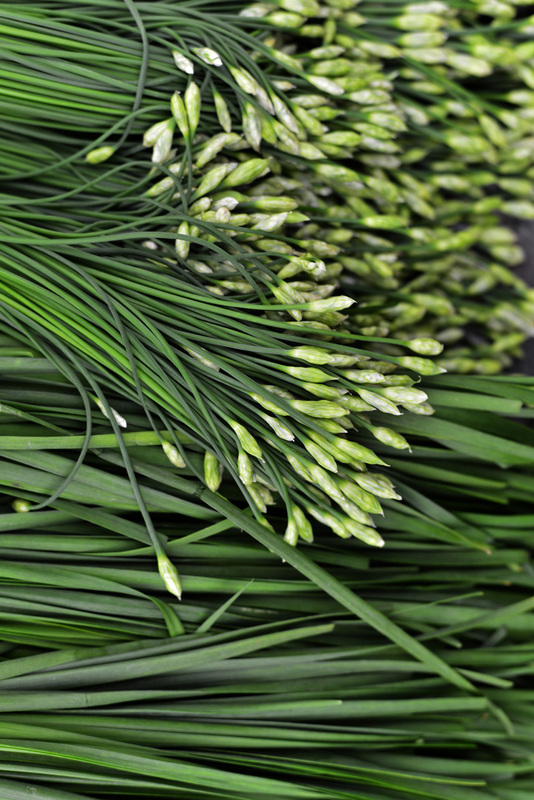 Flat Garlic chives , these were on the Pad thai stall. 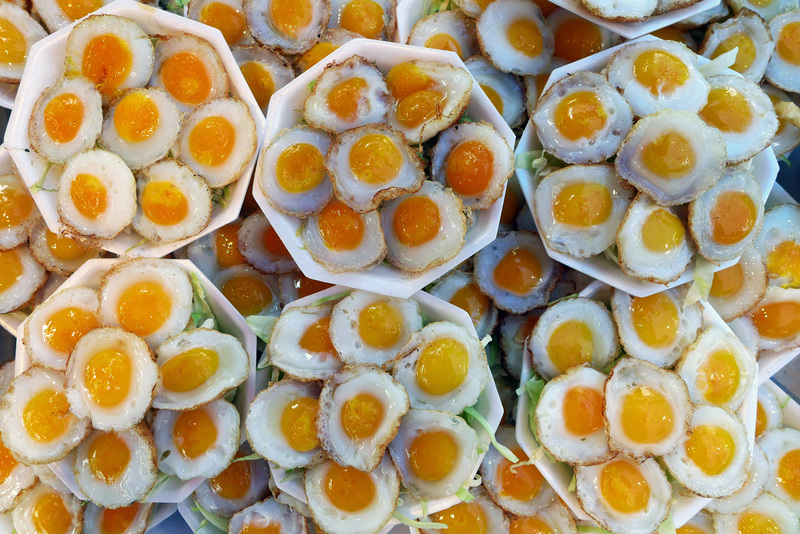 Freshly laid Quails Eggs ready for cooking. The Eggs are simply broken and quickly fried and served warm over a simple salad. 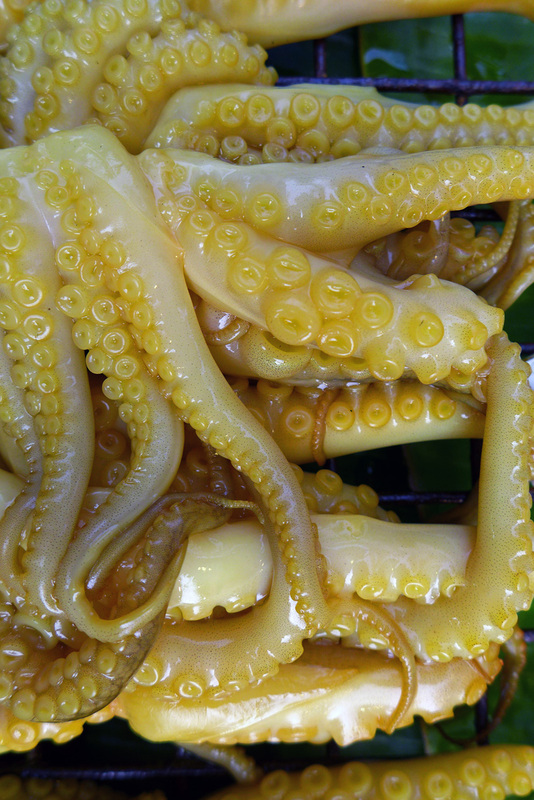 Octopus ready for char grilling over the hot coals. 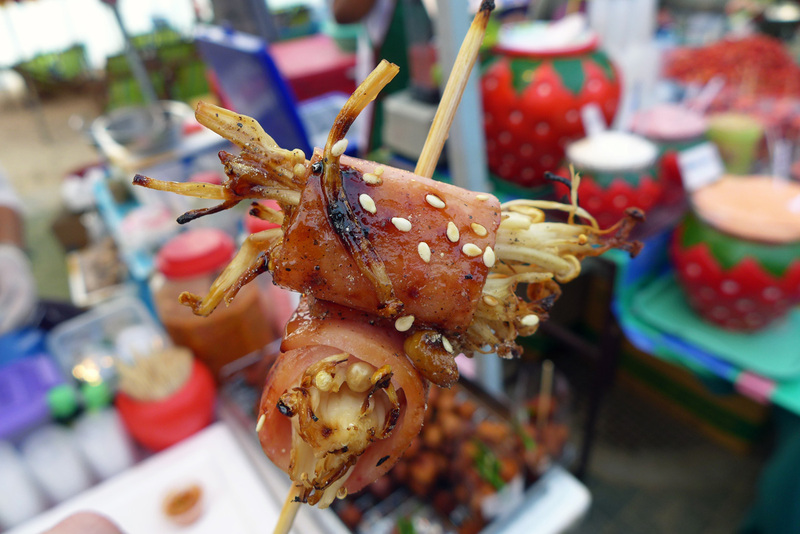 Soy glazed Squid on skewers. 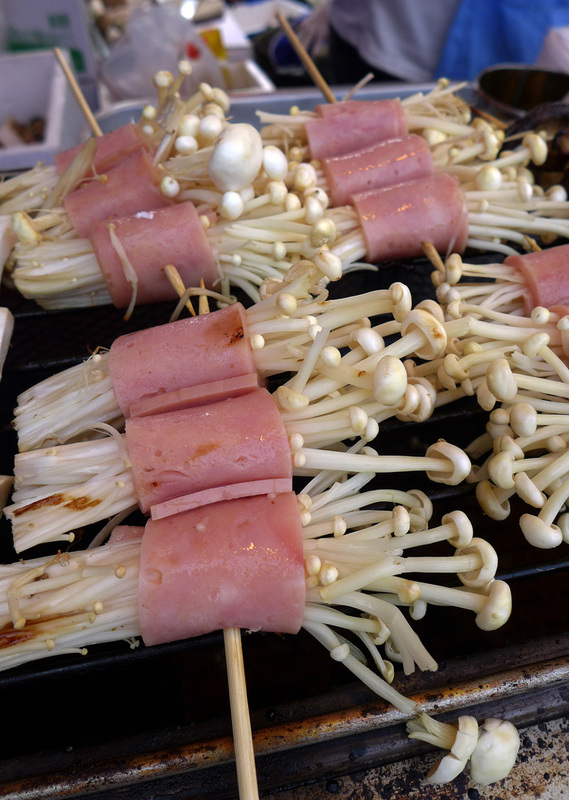 Enoki mushrooms wrapped in Ham and skewered. 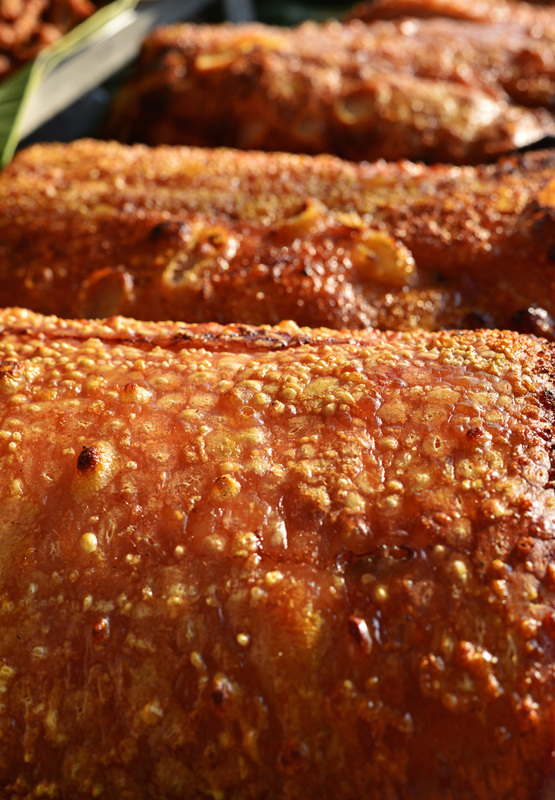 Glazed and then cooked over hot coals. 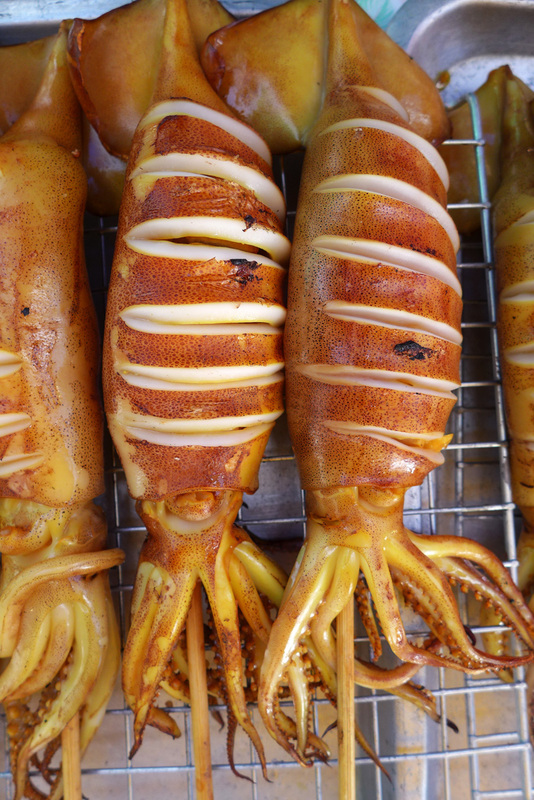 How good is that for innovative beach food ? A first for me. 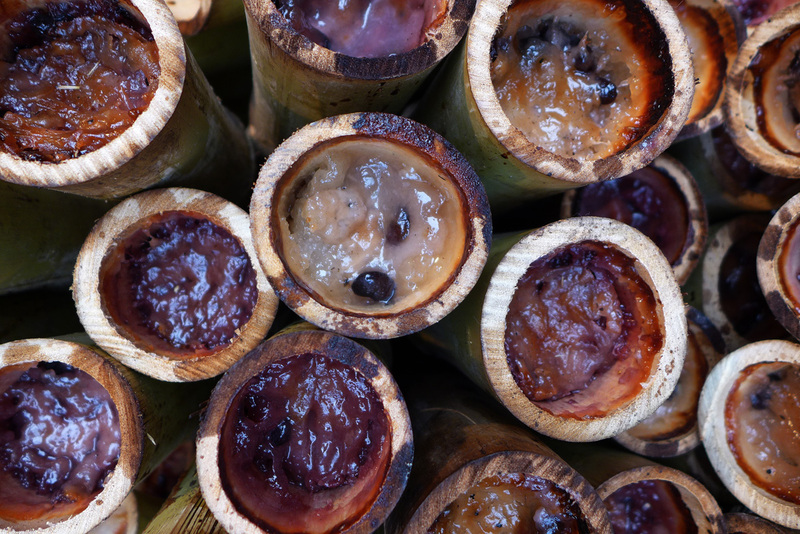 Sweet coconut sticky rice cooked in sealed Bamboo and broken open to order. 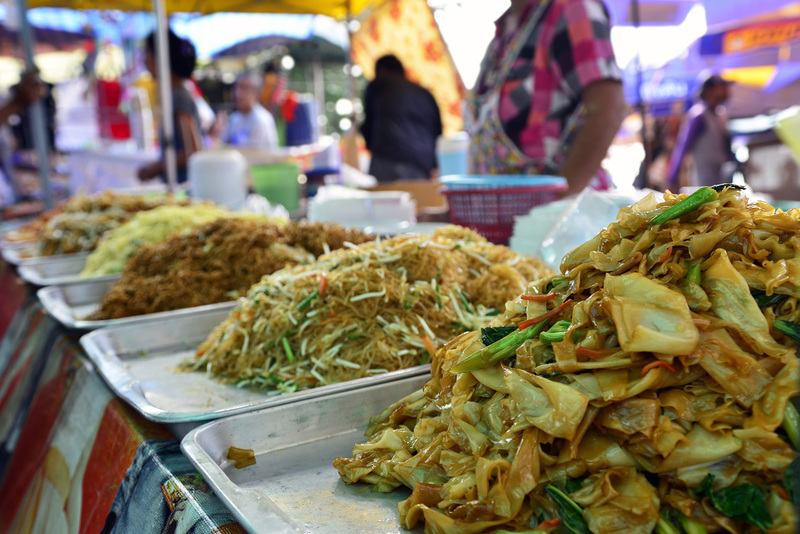 This is the number one salad in Thailand and seems to be every Thais favourite , “Som Tam”. Bashed up unripe papaya , tomatoes , fiery chilli , shallots and green beans. 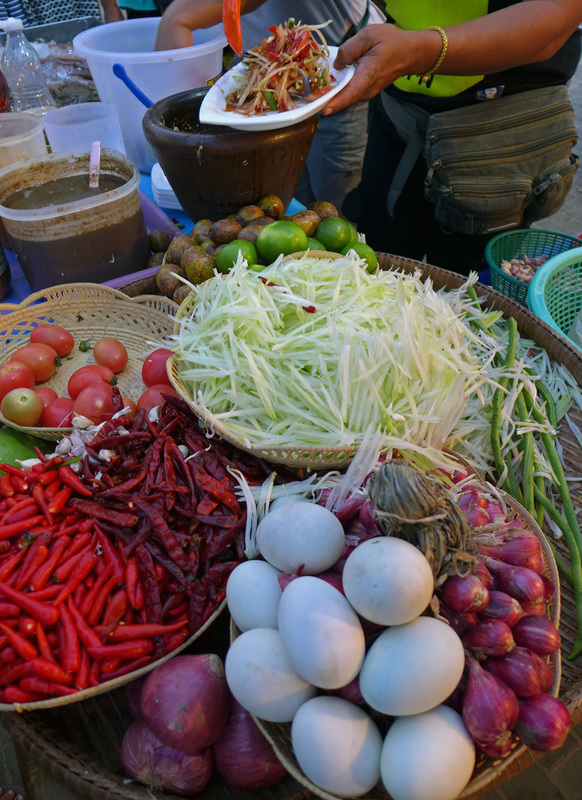 All of the ingredients for Som Tam , its all that this Thai lady makes. 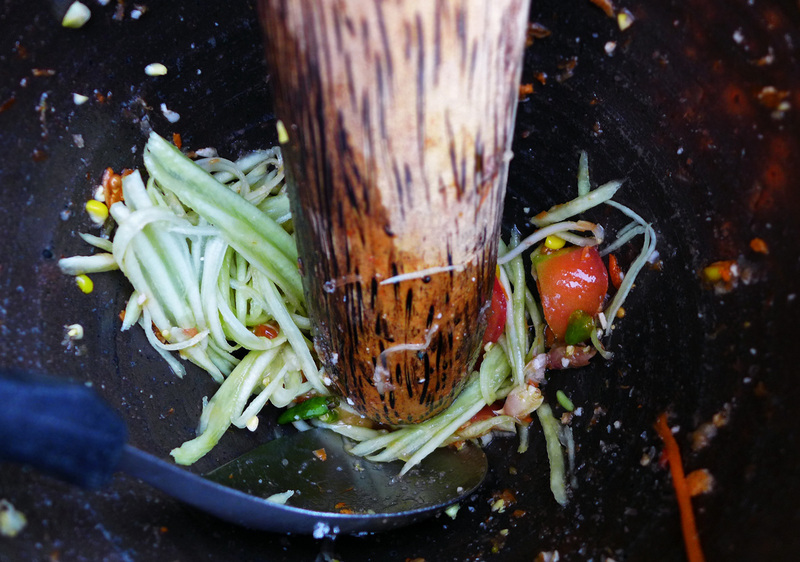 Another vendor makes Som Tam in a different way. 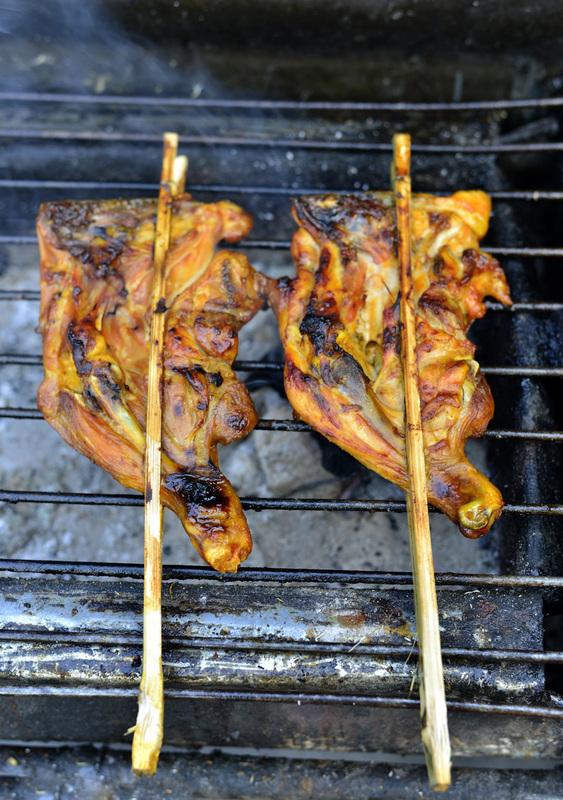 Chicken grilling over the coals. 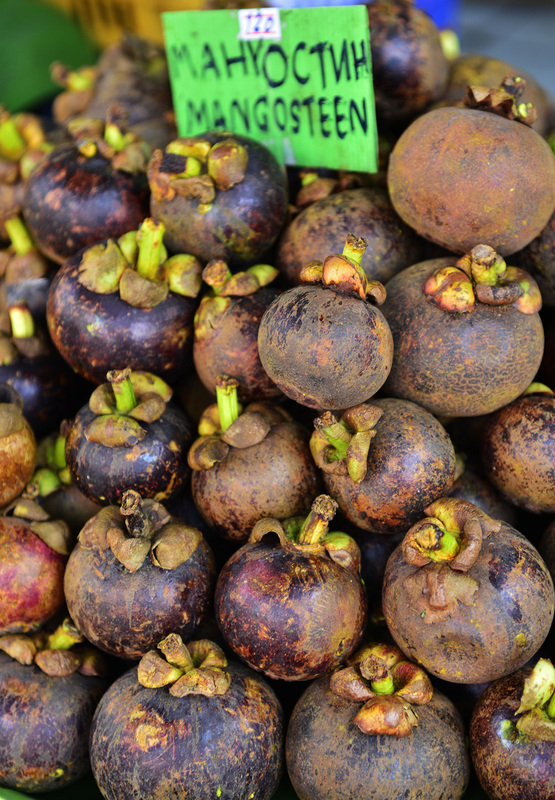 Mangosteen , Perfumed , beautiful tropical fruit. 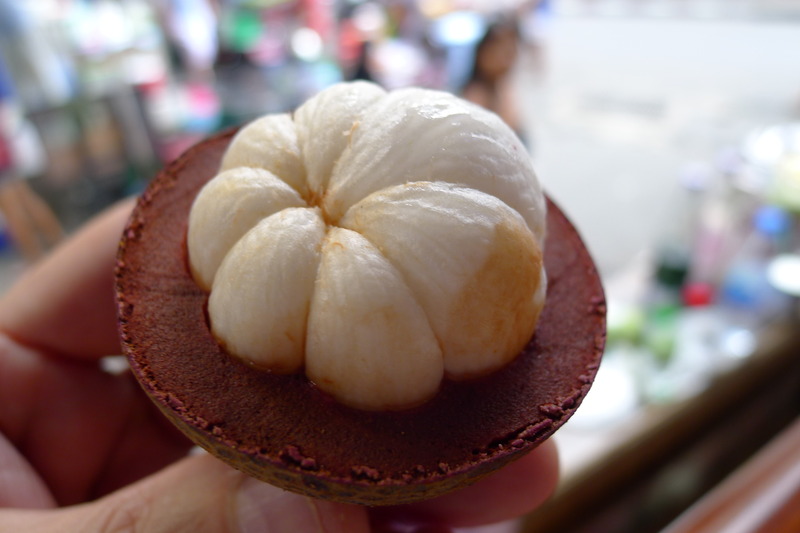 The Mangosteen sliced open to reveal the delicate segments of wonderful fruit. 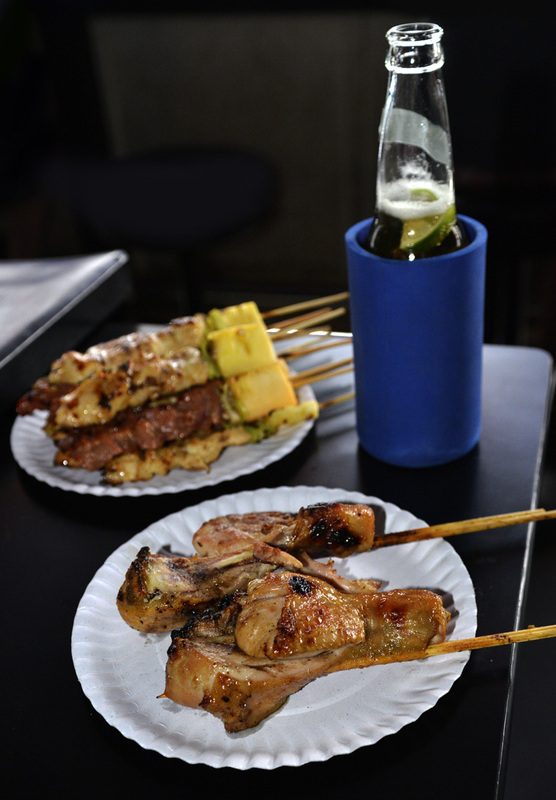 Here`s my ultimate bar food , these are cooked and served everywhere on most street corners 24 hours a day. All you do is pick what you want and hand it to the cook then point at the bar you`re drinking in and within 10 minutes its brought to you. 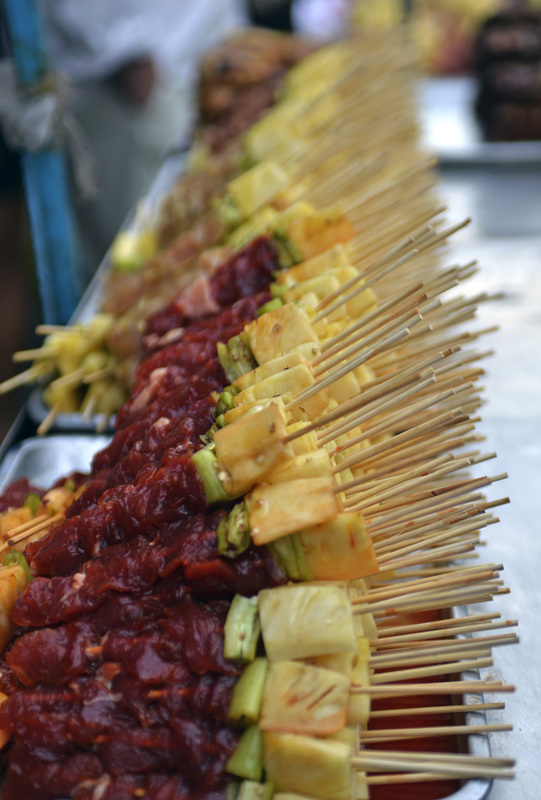 Each skewer costs 10 baht ( 18p ) ( $0.30). What you see here cost 100 baht (£1.85) ($3) , add an ice cold beer at 50 baht (93p) ($1.50) and you’ve got your main meal for the day….or in my case , an afternoon snack. 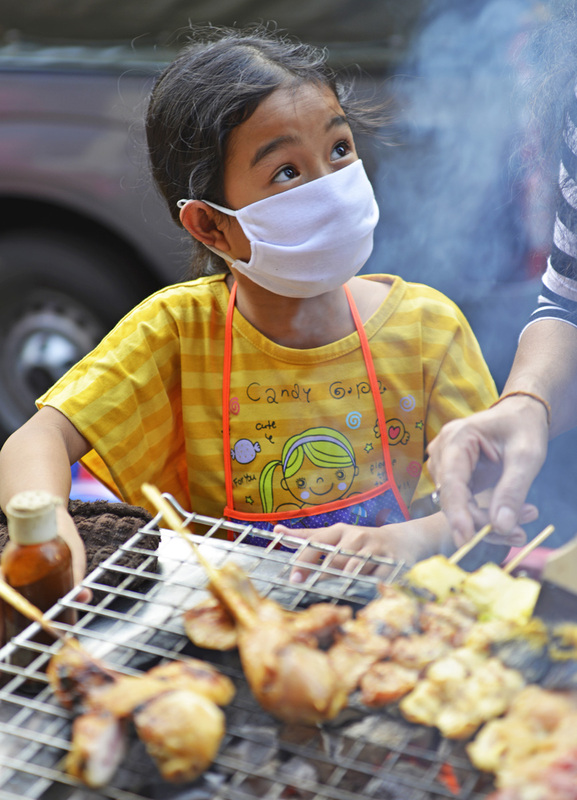 Here`s my little chef knocking me up some perfect street food. And here`s exactly how it arrives off the street….How good is that ? A flight to Bangkok costs from £450 from the uk. A good hotel costs £25 a night….There`s no excuse really is there ? To view the gallery in full then please CLICK HERE. Next Post Fab Friday lunches in town. Wow. Just. WOW. Amazing post, great photos, what a trip!!! Truly amazing photos Alan. Really capture the essence of Asia. Keep it up!